Situated on Spain's eastern coast, it is the capital city of the autonomous region also called Valencia. Thanks to its international airport, Valencia offers convenient international and national access. 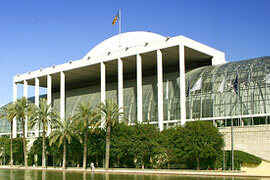 Valencia is the 3rd largest city in Spain, and enjoys many international exhibitions and fairs. Valencia's Mediterranean coast location gives it a year-round pleasant climate. The city was named after 'strength' and 'valour', according to the Roman practice of recognising fallen soldiers after a war. Valencia hosted the 32nd America's Cup, adding to the city's recognition as a popular tourist destination. It is an active city which always offers a wide variety of entertainment to enjoy. Formula One regularly holds races here, on the city's unique track that links the port area with the City of Arts and Sciences, which is a cultural and architectural emblem of Valencia. The world renowned Fallas (annually between the 12th-19th of March) have parades, festive bonfires and fireworks, which all make this a must-see celebration. Valencia has not only a lively nightlife, but an enviable entertainment and leisure scene, one of the most exciting on the Mediterranean. There are enough restaurants, bars, clubs and pubs to suit everyone's idea of a good night out. Valencia offers enough culture to keep you busy during the day also; the Royal Monastery of Santa Marí­a and the beautiful Cathedral are must-sees. Valencia enjoys a fantastic year-round climate, and its coast has one of the most extensive beaches in Spain; there are more than 500 kilometres of coast to enjoy. There are remains of Valencia's varied history, including Phoenician, Greek, Iberian and Roman remnants. Valencia is located opposite the Balearic Islands, in the middle of Spain's Mediterranean coastline. Valencia is also equidistant from Spain's two biggest cities, Barcelona and Madrid. 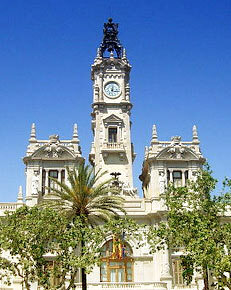 It is the capital of the autonomous community of Valencia, and home to the the largest port on the Mediterranean Sea. The city of Valencia has a long history. In 138 BC it was established as a Roman colony. Its surviving historic centre is one of the country's largest, spreading over 169 acres of land. Until the mid 19th Century, the Old Quarter of the city was protected by a wall. Interestingly, the number 5 bus follows the route on which the wall once stood. The city has many beautiful monuments to visit, such as the Cathedral of Valencia and the Llotja de la Seda (which, in 1996, was declared a UNESCO World Heritage Site). The Seu and Xerea districts contain the city's most notable artistic heritage, where remnants of the Roman empire sit buried under Moorish ruins and modern palaces and churches. Valencia's cultural offerings include many museums, such as The City of Arts and Sciences, The Museum of Fine Arts and the Valencian Institute of Modern Art. 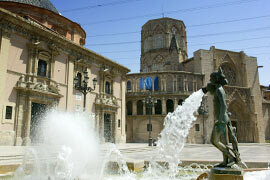 Works by Goya, El Greco and Velázquez can all be seen in Valencia. With its ancient monuments, beautiful views and numerous cultural attractions, Valencia is one of Spain's most popular tourist destinations. Valencia enjoys a full calendar of fiestas and celebrations. Easily the most famous of Valencia's festivities, the Fallas celebrations fill the streets of the city and sixty other towns in the Valencian province. Dedicated to Saint Joseph, enormous cardboard sculptures are erected, later to be burnt amidst the explosion of firecrackers. The Corpus Christi celebrations, the Fiesta of Moors and Christians and the nearby, incredibly messy tomato-fight festival called "La Tomatina" at the end of August contribute to Valencia's reputation for throwing great parties!